These are the play doughs I have tried. I know I can just as easily make my own but I didn't want to be bothering with food color too. I just make sure that when we do play with the dough, we do so with clean hands and keep to a clean table. 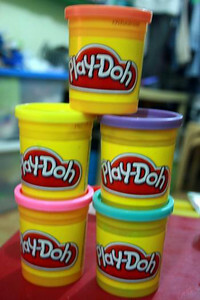 The long and short of it is, you can't really miss with Play Doh. They sell packs of 3 for only P125 but each tub costs about P40. A new one can be quite sticky though so my hubby doesn't like playing with a fresh tub. It's easy to soften up too, both an upside (when you forgot to put it back in its tub and it got dry) and a downside (because you might not know just how much water to add to soften it up). Play Doh also has so many mold sets to choose from (albeit, a little on the expensive side). A niece has the ice cream factory one. I am actually dreaming of buying that one with the table container just so my son will have a designated table for his play dough time and a container for all the molds and accessories. But the sets are quite expensive and if you have a lot of dough already, you don't really need all the dough that come with the sets. But in terms of color choices, Play Doh really offers variety. The Art Academy play dough are actually more expensive. A separate pack of just dough makes each tub cost around P60. But we got ours with my son's Farmer and Friends Dough Kit. You have to really add water to it and it can stain your hand, but once properly moldable, I think it's better than Play Doh for dough models you want to be upright. It holds its form better, so to speak. 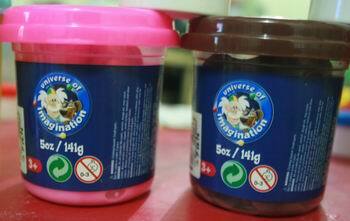 The Universe of Imagination play dough is my favorite of the three. It's not too soft like Play Doh and holds its form well like Art Academy's. If it ever toughens up, it only requires a few drops of water to make it malleable enough again. Colors are limited though (i've only found red, blue, yellow, white, pink, and green) but each tub only costs around P30 each. 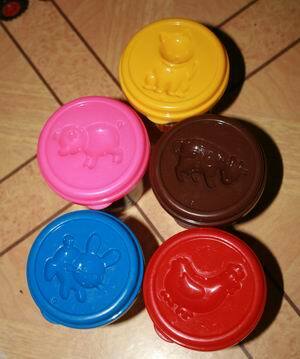 One other thing going for Art Academy and Universe of Imagination play dough is that their tubs/containers have molds for animals. The small white tubs of dough in the first pic are dough from sets bought from Anding's Toy Store. I am not sure if they're non-toxic as am sure these three are (and other brands too, like Crayola) so I don't recommend them for use with really young children who are still likely to taste or lick their dough. Play dough is great for developing your child's hand dexterity as well as his imagination. It even relaxes parents. Thus, it's a toy I really highly recommend that all parents provide for their kids (and in our case, for Mommy too).